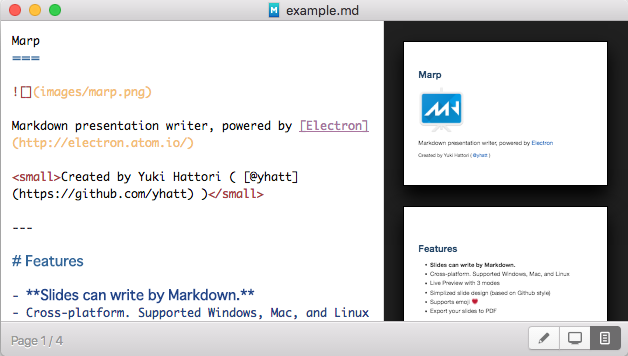 Recently I’ve been using this simple tool called Marp for generating presentation slides from my markdown documents. It’s really a nice interface and simple to use. However it appears limited to only 2 themes for your slides. After some research I found some great ways to customize the themes. Follow these steps to create a new theme that can be selected from within the Marp application. Copy an existing SASS file (such as gaia.sass) to create your new style. For now do not edit your new theme. Let’s just get this new theme to show up in the Application. When that is working for you, then you can come back to this file and make your edits how you wish. Modify the following 2 coffeescript files to add the new theme to the application. Add a new entry for your theme in the following code section that contains the array of *themes. Add the name of the new theme to the array. Test the new changes by building the project. This will compile the changes and run the application. If you are happy with the results, you can also create a new release which can be copied to your application folder and overwrite the previous version. You can have custom styles for each slide without having to always create a new theme within the application. Use the following tricks. Select one of the themes from the application menu, View > Theme > Default for example. Override any of the theme’s style by adding the <style> tag to your markdown document. Here is an example. Note that you might need to use !important for some properties to be able to override the existing styles from the theme you selected. Instead of having a huge HTML tag at the top of your markdown, you can create a CSS file that contains your standard theme settings and then simply import that file using the <link> tag. In fact you can do both. Use the <link> tag and use the overriding <style> tag to create customized looks for a particular set of slides. You can also copy an existing theme that Marp provides (Default or Gaia) and extract the generated CSS file from the application to then customize it and use it going forward. To get the CSS file for a particular theme, you need to run the application from the source code. Follow the steps above and run the application using npm start. At this point you can see that the css folder has been generated. You can now copy the CSS file that you want. Finally, use the <link> tag to point to the new default.css file and whenever you want to make some changes to the theme go ahead and edi the CSS file directly. Making custom slides and themes in Marp is not so bad at all. Hopefully the new Marp Next application will have these features more easily available for us. Credit to the following blogs for the initial ideas. How to change the theme in Marp.